When you think of milk, you probably picture a cow. Or maybe a goat. Or maybe almonds. But what about…donkeys? Yeah, me neither. But apparently, donkey milk has some pretty amazing properties and is AWESOME for your skin. 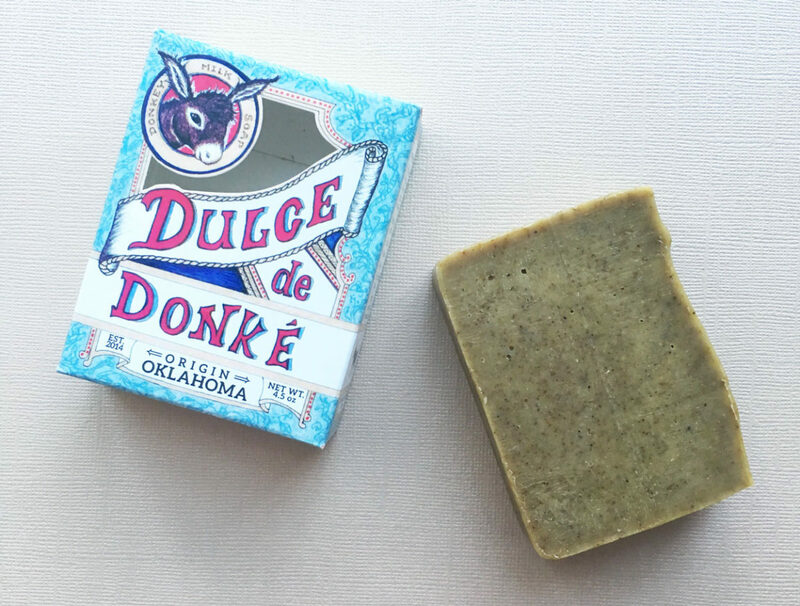 I tried out a soap bar by a family-owned company called Dulce de Donke, which is made with donkey milk. Keep reading to learn about the benefits and how I liked the soap! First of all, I heard about Dulce de Donke through the Organic Beauty Lovers Club. If you are interested in testing and reviewing organic beauty products, then you need to sign up for this! They send you products in exchange for an honest review. Pretty awesome if you ask me. So you might be seeing more OBL reviews from me in the future as well! According to Dulce de Donke, raw donkey milk is rich in ceramides, proteins, phospholipids (fatty acids), vitamins, minerals, and omega 3 & 6 fatty acids. Donkey milk is known to hydrate dry skin, regenerate, and reduce wrinkles. It is traditionally used for psoriasis and eczema. Apparently Cleopatra had her own herd of 700 donkeys for her daily donkey milk beauty bath. It is also anti-inflammatory and rich in probiotics. If you are weary of using it because you are sensitive to cow’s milk, good news! Donkey milk has hypoallergenic properties for humans because it is so close in comparison to human breast milk. Who knew. I will never look at donkeys the same! Read more about the benefits of donkey milk. So back to the soap. Overall, I really liked using it and would definitely buy it to use again. I used the Rosemary Mint bar. Smells amazing, minty but not too minty. Lasted about a month, with both my husband and I using it (almost) daily. This seems longer than most soaps. It didn’t break in half or anything either. The ground rosemary makes it nice and exfoliating, so you get a little bit of a scrub while using it. It definitely kept my skin hydrated – it never felt itchy or dry. Although there is a slight lather, it’s not SUPER sudsy. But enough to make you feel clean. You can smell it while you’re in the shower using it, but I couldn’t really smell it after showering. The scent didn’t seem to stay on my skin afterwards. Dulce de Donke makes other scents and varieties of donkey milk soap as well.